There can be few less likely settings for a church than that of St Luke. It sits among bungalows and semi-detacheds in the 1960s south Lowestoft infill between Kirkley and the ring road. Tucked in among the yellow brick houses is this curious building behind its polite suburban wall. You almost expect to see a neatly clipped lawn and a Dun-Sinnin sign hanging on the gate. It is built in the style of the houses around it; and yet, it is not uninteresting. 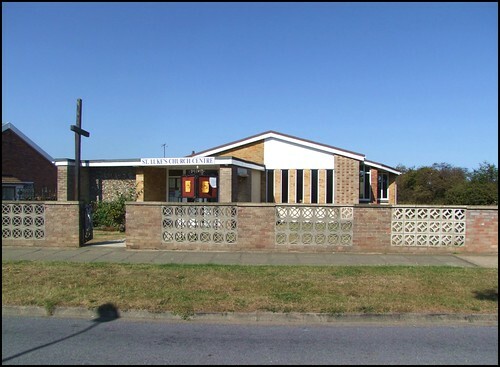 Dating from 1960 (the foundation stone was laid in 1959), it was built as a chapel of ease to St Mark and in what Mortlock memorably refers to as ranch-style. The construction is actually quite complex, consisting of a variety of bricks and pebbledash, low-pitched and flat roofs. A dual-purpose hall is partitioned off from the sanctuary, which is lit from several tall side windows as at Ipswich St Luke, a church of which this is reminiscent. The elegant brick-lined sanctuary is set in white walls, creating a real focus. The one outstanding feature to be seen from the road is a tall, wooden cross, which signals the main purpose of this building to its not dissimilar neighbours. The couple on duty inside on Historic Churches Bike Ride day 2009 were very proud of what has been achieved here over the last half a century; and so they should be, for this building is in regular use by local groups of young and old people, providing a valuable to resource to what is by no means one of England's richest towns.